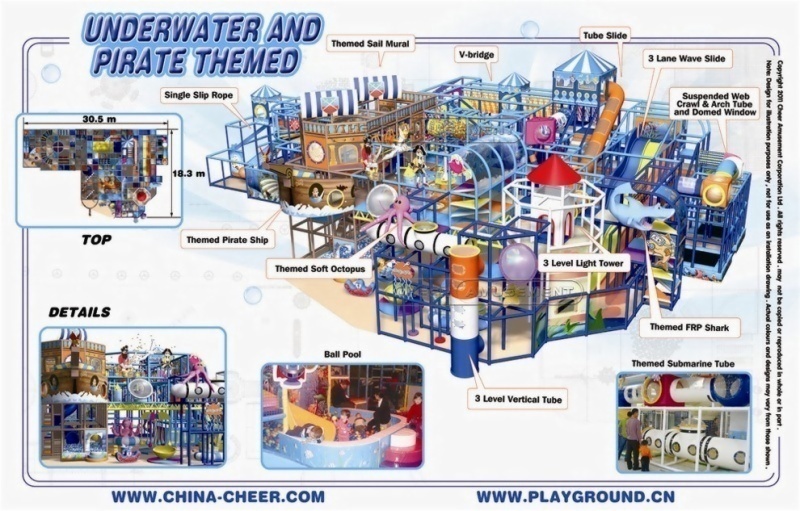 Components Themed Pirate Ship, Singe Slip Rope, Themed Sail Mural, Themed Soft Octopus, V-bridge, Tube Slide, 3 Level Vertical Tube, 3 Level Light Tower, Themed FRP Shark, Suspended Web Crawl & Arch Tube and Domed Window, Ball Pool. 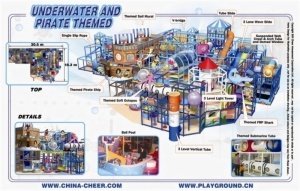 Indoor Playground Items: Themed Pirate Ship, Singe Slip Rope, Themed Sail Mural, Themed Soft Octopus, V-bridge, Tube Slide, 3 Level Vertical Tube, 3 Level Light Tower, Themed FRP Shark, Suspended Web Crawl & Arch Tube and Domed Window, Ball Pool. Themed as if a pirate ship had crashed near the sea shore and this unique design fits well in almost any facility. Combined themed pirate ship and FRP shark, this design packs a real wow punch! There is always a small voice coming into your ears “Dad,Mum, I wanna be back tomorrow. Is it OK? I am really loving here.” When the parents take their kids home after the kids were completely exhausted in the playground. Ideal for: Birthday Party Centers, Daycares, Entertainment Centers, Cinemas , Fitness Centers and any Retail Environment.